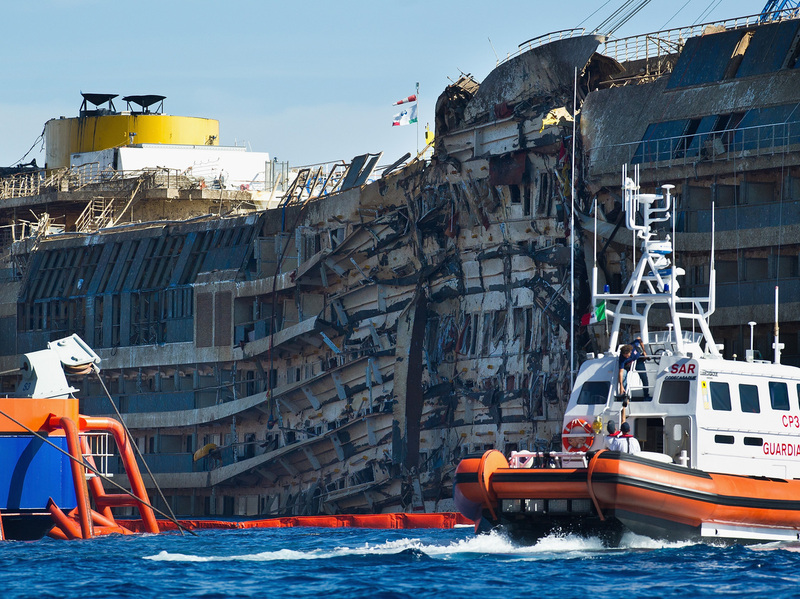 Two Bodies Found Near Costa Concordia Wreck : The Two-Way The remains are presumed to be of a passenger and crew member still unaccounted for from the January 2012 disaster that killed 32 people. The remains of two people, presumed to be a missing passenger and crew member from the ill-fated Costa Concordia, have been located by divers near the site of the wrecked cruise liner that was righted last week in a dramatic salvage operation off the Italian coast. Authorities say DNA tests will be needed to confirm whether the remains are of an Indian waiter, Russel Rebello, and passenger Grazia Trecarichi of Sicily. The two are the last unaccounted for among the 32 people killed in the January 2012 wreck. Coast Guard and Customs Service divers found the bodies near the center portion of the ship, where the two were reportedly last seen alive. The Associated Press quotes Civil Protection chief Franco Gabrielli telling reporters that victims' relatives, who had traveled to the island in hopes that their loved ones' remains could be found, were immediately notified of the discovery. The Costa Concordia's captain, Francesco Schettino, is currently on trial in Italy for manslaughter and abandoning his post during the disaster.